Downtown Yoga is located just down the street from The Roost on the opposite side of Washington Ave. Downtown Yoga hosts health and spiritual workshops and strives to offer affordable yoga to everyone. With emphasis on breath awareness, meditation, and movement, this studio provides classes that promote both physical and mental well-being. Downtown Yoga offers 14 classes, (and growing), offered every week with certified, experienced, and fun teachers! River Rock Yoga offers a refreshing and inspiring atmosphere to explore movement and stillness. Owned by one of local artist Walter Anderson’s grandchildren, River Rock has deep roots in Ocean Springs. River Rock is a yoga studio devoted to offering a wide variety of yoga classes for students at every level of practice. With over twenty-five classes a week and nine certified, registered instructors, River Rock Yoga also offers Pilates, PIYO and Hoop Dance classes. 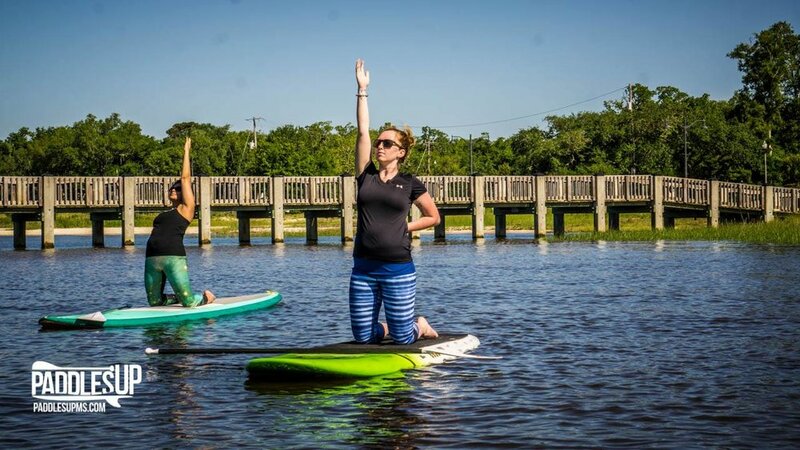 This unique yoga class is provided by Paddles Up Ocean Springs which offers kayak and paddleboard rentals as well as a skate & surf shop complete with activewear. Experience yoga bliss atop your board as you are guided by trained teachers and take in the beauty of the natural surroundings. All levels are welcome! No yoga or paddle boarding experience required. Visit their website to see when the next SUP Yoga class is available!